The other day I was reading an article on a recruitment site about what HR people think when an applicant has on their CV they are a member of Mensa. I knew where it was going, of course. And, sure enough, I was right. It wouldn’t actually stop this guy hiring someone, but if it came to a choice it would be the Mensa applicant who didn’t make the cut with their inadequate “look at me”ness. Now, I know Mensa is problematic. But this made me think about a more general thing I’ve wrestled with much of my adult life. When I won the World Intelligence Championship in 2000, I had just withdrawn from a doctorate following a major breakdown, and my overwhelming feeling was relief. Just as I had my life turned upside down, and I had no idea where the next month’s rent might come from, here was the answer. Surely all sorts of incredibly exciting employers would be beating my door down to get their hands on the World Intelligence Champion. Of course, they weren’t. A few months later I managed to secure myself a part time job as a warehouse hand for a flooring company, and the people I worked with found the fact I could do puzzles amusing. But the only time I have found it actually useful was in filling a session I gave at a Tradecraft Fair for intelligence analysts – I did indeed attract a full session. But not a job. What use is a medal? 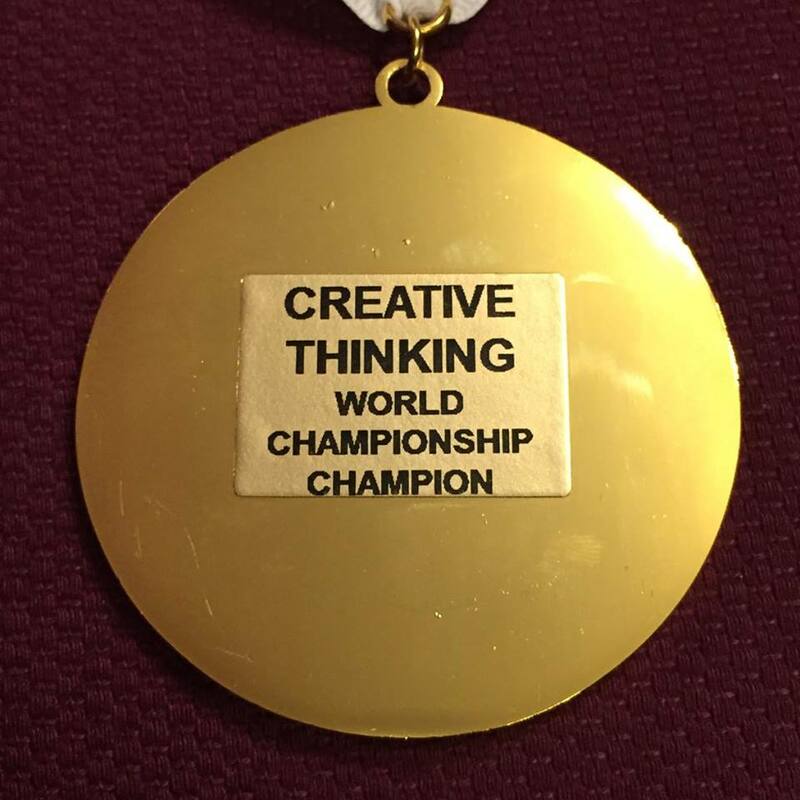 And then, last summer, I won the Creative Thinking World Championship, and that same glimmering thought was there. Creativity is huge. This is the innovative information-y creativity-ish thingy age. Who wouldn’t want to snap me up? And then I had the complementary thought – if I can’t think how to make a living with my creativity I can’t be that creative after all, can I?! And that made me wonder, as I usually do in such situations, exactly what was happening. For businesses, and all kinds of organisations, creativity is of immense value. But the value comes in what it is that the creative mind can bring to them. Be it a new perspective, a way around a procedural roadblock, access to a new market, a unique copywriting style, or just a way of making the workforce happier, creativity can transform organisations. And that unmasks a fundamental problem. Creativity is not so much about thinking outside the box, as it is about wondering if the box is an alien milkshake maker sent to convert us to the worship of the beetroot flavour ice cream float. And yet the reason that creativity is so important and so valued is its potential for driving real innovation within real, for want of a better word, boxes. There is no mistaking the fact that there is a problem with creativity, and the problem is the box. The box is what concretises the fluid, what specifies the general, what pins down a skill whose essence is its transferability, while from the other side a practice whose nature lies entirely in its being practised and not in the results of that practice is always in danger of becoming fundamentally meaningless. The real problem is, as it were, identifying what the problem is so that we can find a way for the organisations who desperately need creatives and the creatives who desperately need a place to focus their efforts for goals they believe in to find each other. The two sides of the problem come down to this. The most creative individuals think in ways that boxes cannot begin to calibrate and categorise, they leap canyons from mysterious cliff to obscure mountain face leaving behind a unique trail of brilliance whose usefulness is clear to no one. And they get more creative by being given the freedom to fail. And yet their creativity comes into crystal clear focus when it comes up against the real world problems we face and their potential solutions – problems that act like liquid nitrogen on a molten object, instantly freezing a previously flowing substance. And organisations face real, concrete problems – reaching actual audiences, meeting an actual technological need, overcoming an actual social or environmental problem, answering real questions. And yet the answers and solutions they offer will improve significantly by coming into contact with those whose method of working is to take the concrete and abstract it, to provide a melting fire to their easily quantifiable ice. The problem is that doesn’t seem to me to be how creative innovation works (the big subtext here of course is “more research needed”). It is certainly not how I outlined my thoughts of it in the earlier piece here on searching for a goldilocks zone of creativity. Creativity, as I conceive it, works such that creatives who are given free rein will sometimes make a positive impact and bring exciting innovation to a project or a group. The quantitative issues at play relate to the number of creatives from a given set who make such impacts and not the amount of impact that all creatives may make. If you box a creative in, you do not reduce their potential for impact, you effectively cauterise the creativity. Seeking a solution by convergence is simply seeking to create one of those “maximum freedom within minimal parameters” situations that give the illusion of a freedom that is completely not present. The problem, in other words, isn’t the shape of the box, it’s the box. And that means the problem belongs to both sides of the equation. For organisations to benefit from creativity, they need to allow that creativity free rein; they need to accept that many of the outcomes and outputs, from individual creatives and their creative programme as a whole, will lead nowhere but an enjoyably quirky ride; and they need to bring creatives in without, over-regard to their potential usefulness. Literature review – what beneficial impact do creatives have on organisations? How do you even begin to segment the above data to arrive at meaningful definitions of “beneficial”, “impact”, and “organisations”? What steps can be taken to make the findings of the above relevant to particular organisations? How can creatives showcase their creativity in such a way as to appeal to organisations without putting themselves within organisational boxes?